Although stable Hispanic populations have existed in some regions of the United States for centuries, other regions, including the mid-Atlantic South, are just experiencing the emergence of permanent Hispanic communities. 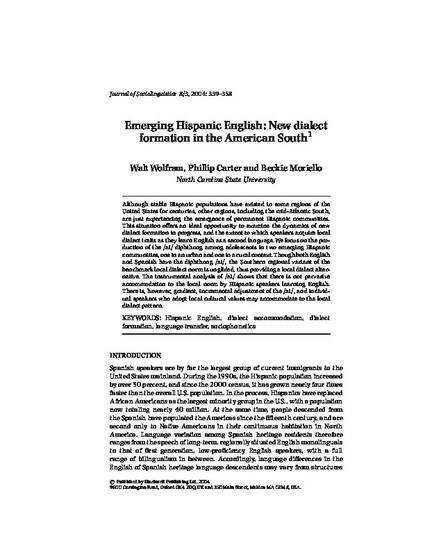 This situation o¡ers an ideal opportunity to examine the dynamics of new dialect formation in progress, and the extent to which speakers acquire local dialect traits as they learn English as a second language.We focus on the pro- duction of the /ai/ diphthong among adolescents in two emerging Hispanic communities, one in an urban and one in a rural context. Though both English and Spanish have the diphthong /ai/, the Southern regional variant of the benchmark local dialect norm is unglided, thus providing a local dialect alter- native. The instrumental analysis of /ai/ shows that there is not pervasive accommodation to the local norm by Hispanic speakers learning English. There is, however, gradient, incremental adjustment of the /ai/, and individ- ual speakers who adopt local cultural values may accommodate to the local dialect pattern.